Silver Arrow. 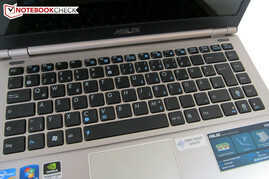 Buyers looking for a compact, reasonably priced, yet attractive multimedia notebook will find the U46SV to their liking. 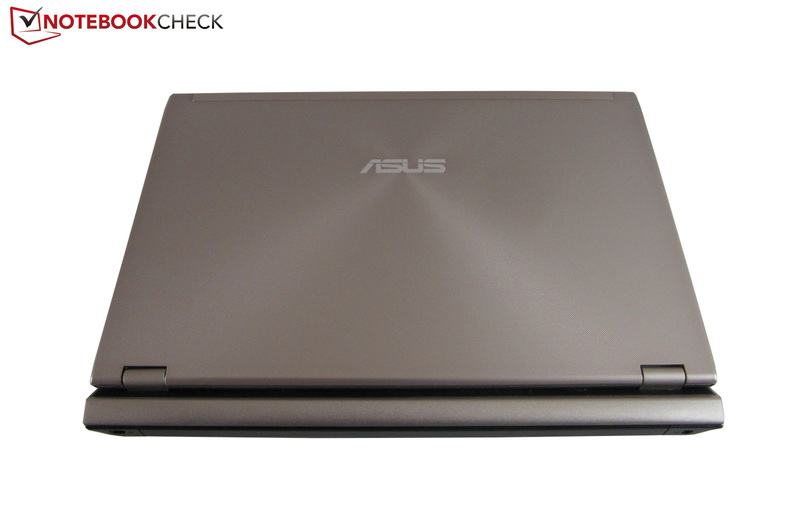 Asus combines a 14 inch case with balanced middle-class hardware. So the question is: do the powerful battery and the graphics switching technology deliver a long battery life? Potential buyers beware: the Asus U46SV boasts a compact and relatively light 14 inch case, which houses potent middle-class hardware. Thanks to Nvidia's Optimus technology, the laptop will be able to run up to 10 hours (manufacturer's information) with its 8 cell battery, making the device very mobile. 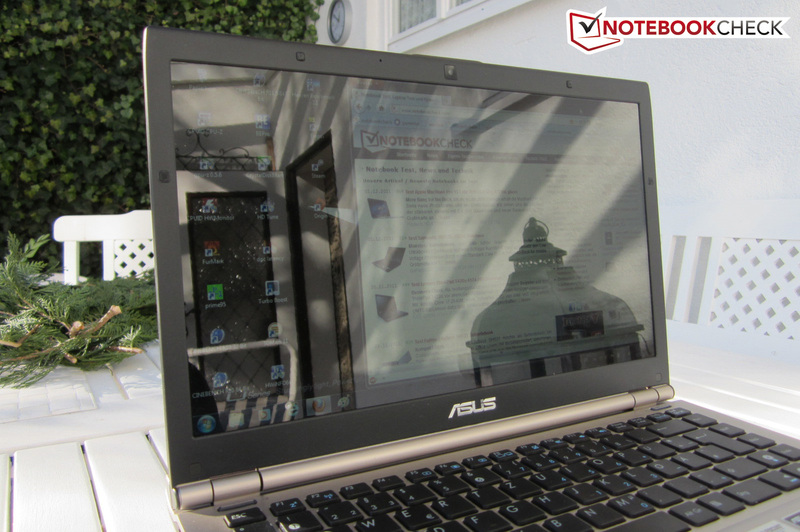 We picked the cheapest version of the new notebook (the WX036V) to see if Asus delivers on its promises. For around 750 Euros, the buyer will get a dual-core CPU (Intel Core i5-2410M) and a DirectX 11 all-round graphics card (Nvidia GeForce GT 540M). Four GB DDR3 RAM, a 500 GB HDD and a DVD optical drive are also on-board. Three additional (European) models are listed on "Geizhals" (a price-comparison search engine). The models are available starting at 800 Euros (WX044X - identical to our test model, except it has Windows 7 Professional not Home Premium). The most interesting models are the WX084V and the WX096V, which house a stronger processor (Core i5-2430M). Price: under 800 Euros. The 14 inch case looks very nice. The U46SV is not completely made of synthetic material - some parts are made of high-quality aluminium. The hand-rest regions and the display cover are especially pleasing to the eye as they have a nice design (lines and circles). 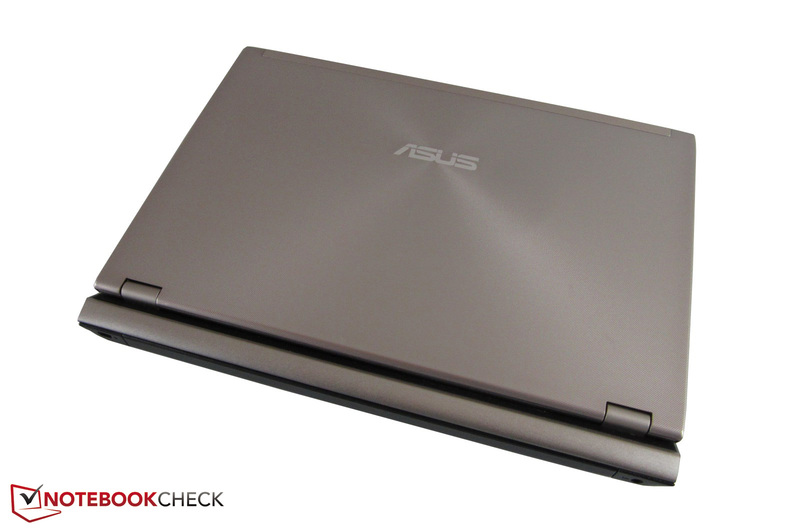 Asus thought up something new for the shape of the case: the laptop has stylish roundings. Another highlight is the good color mix: silver surfaces and black parts (display border, keyboard and bottom) give the notebook a fresh and unique look. Most surfaces are matt, which helps keep the laptop clean. Sadly, the case is not perfect. The workmanship could have been better. Closer inspection revealed that our test model had multiple rough edges. The hinges are not very good either: When opening, the base of the laptop swings with the display. 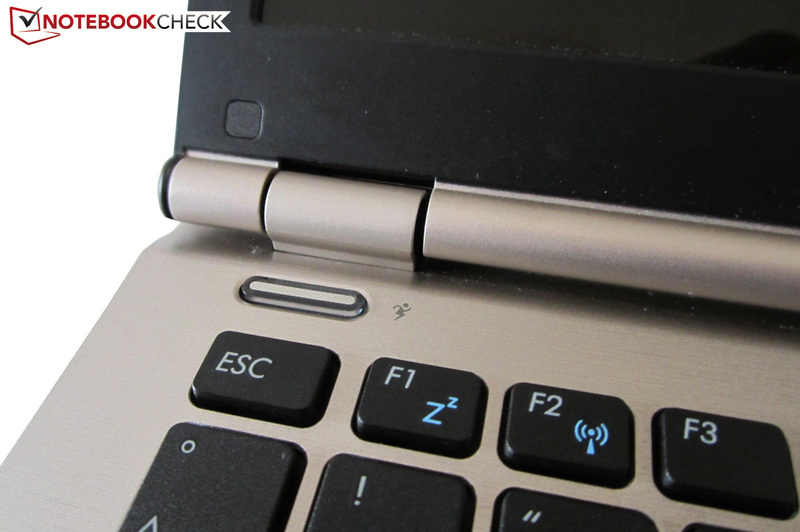 Even when the laptop is open, shaking the base will result in the display wobbling. The sturdiness of the case is good. The base of the laptop barely gives way under pressure. On the other hand, the thin notebook display cover is quite weak. The low weight (roughly 2.3 kg) and compact dimensions (333 mm width & 245 mm length) make the notebook very mobile. 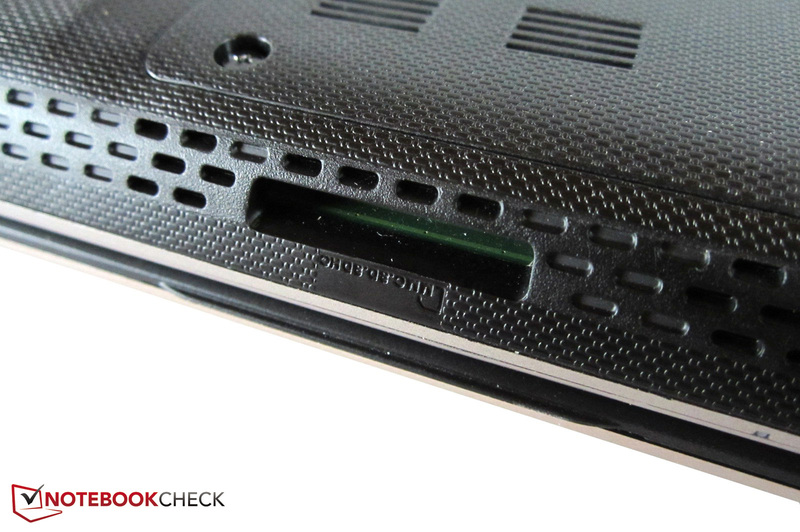 The thickness of the notebook varies depending on whether the battery is attached or not (3.7-2.8 mm). 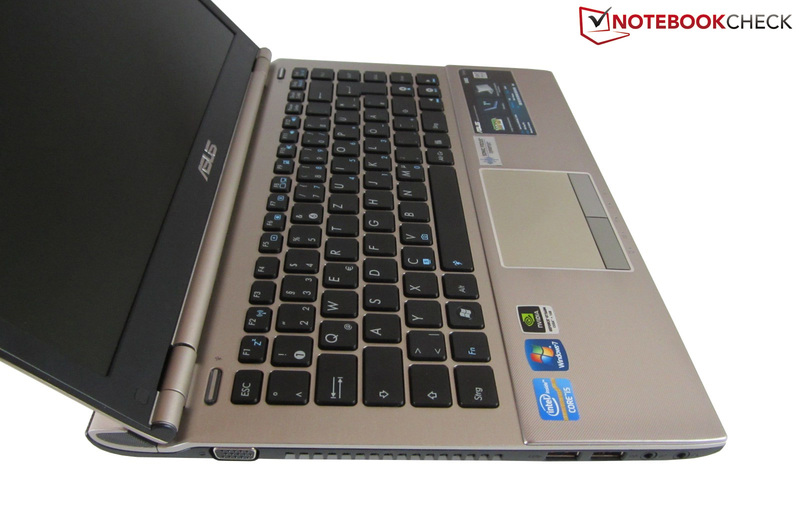 Overall, the U46SV can be described as a mobile and eye-catching multimedia notebook. Asus loses valuable points in this section. Our test model lacks eSATA, FireWire and ExpressCard interfaces. It only has two sound jacks (headphone and microphone) and three USB ports (1x USB 3.0) - a meager assortment. External displays can be connected via the analogue VGA port or the digital HDMI interface. Memory cards (SD, MS, MS Pro and MMC) can be read by the integrated card-reader. 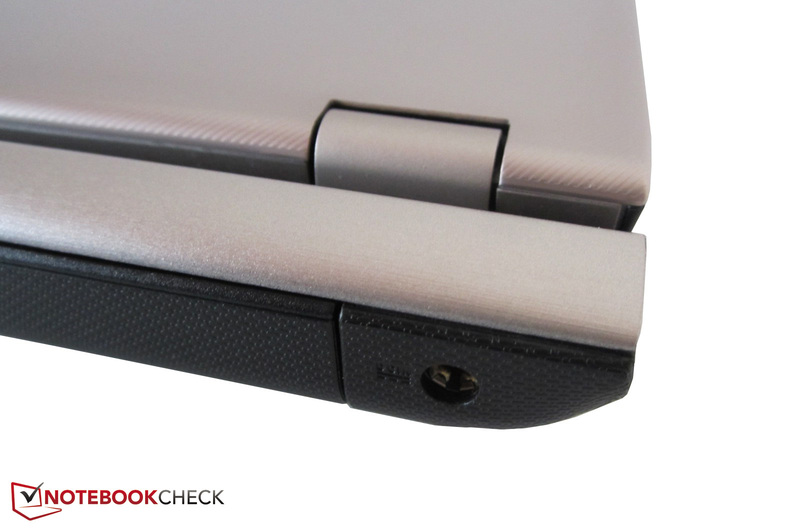 The Kensington Lock is placed at the back and can be used to secure the laptop. With the exception of the left side, we found the ports to be well-arranged. Internet can be used with a LAN cable connected to the Gigabit LAN port or via the WLAN module (Wireless - b/g/n standards). 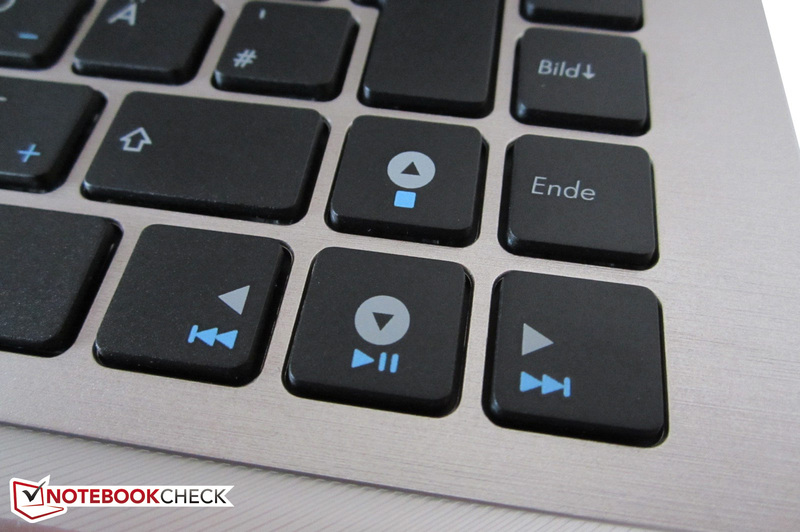 The laptop also offers Bluetooth (3.0). Asus continues to install "Bloatware" on its laptops. 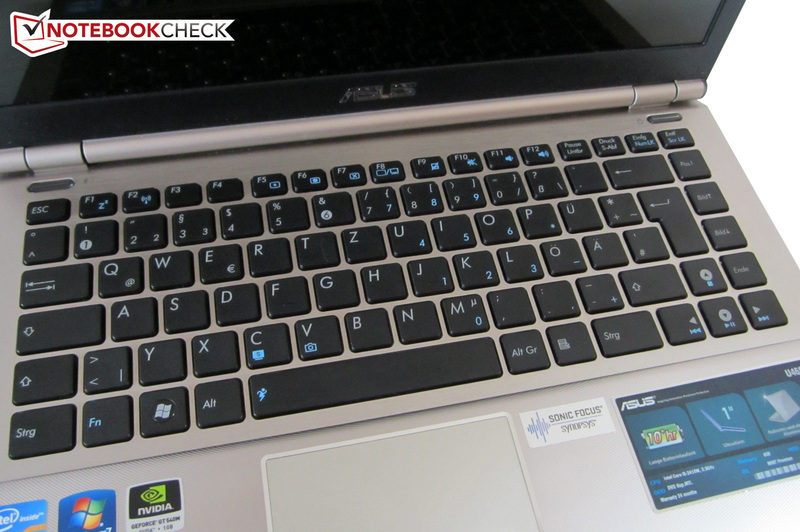 A lot of the programs pre-installed on the test model were designed by Asus. However, there are many from other companies. All-in-all a lot of software which slows down the computer by increasing the boot time and dropping the reaction time of the system right after it starts. We recommend that buyers free their laptops of this problem. The delivery package contains the long 8 cell battery (74 Wh), a compact 90 W power adapter, a warranty card, a manual and a "Driver & Tools" DVD. The package also holds a cable tie and a cleaning cloth for the laptop. 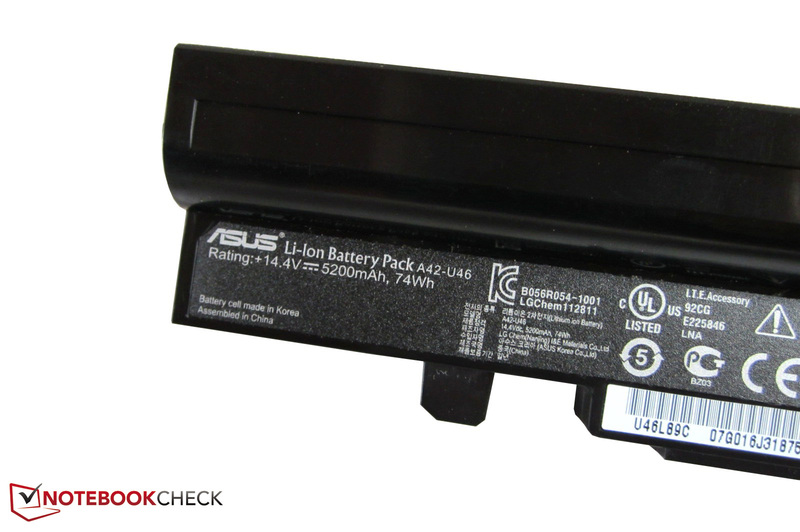 As usual, Asus provides a 24 month warranty for its models (one year for the battery). The input devices are great. The matt black keyboard has a crisp typing feel and a free design ("Chiclet" keys). The great feedback, decent key size (15x15 mm) and properly thought-out layout make typing on this laptop a nice experience. The keyboard also deserves praise for its numeric pad replacement which can be used by pressing the "Fn" key. The only flaw is the clearly audible typing noise. This keyboard might seem familiar to a few readers: the barebone manufacturer, Clevo, uses a similar model. 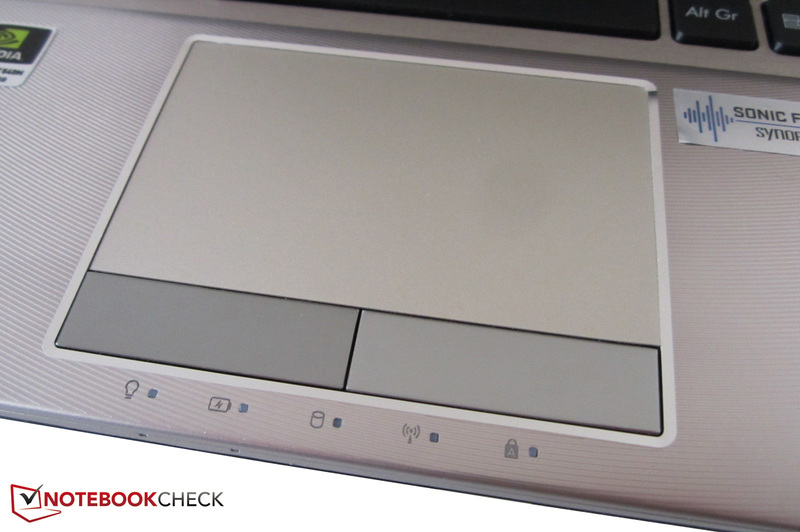 The touchpad also leaves a good impression. The device can be deactivated and has good dimensions (86x51 mm). The touchpad supports multi-touch gestures (such as, zooming, scrolling and flipping) which are quite sensitive, yet dependable. Overall, the touchpad provides precise input. 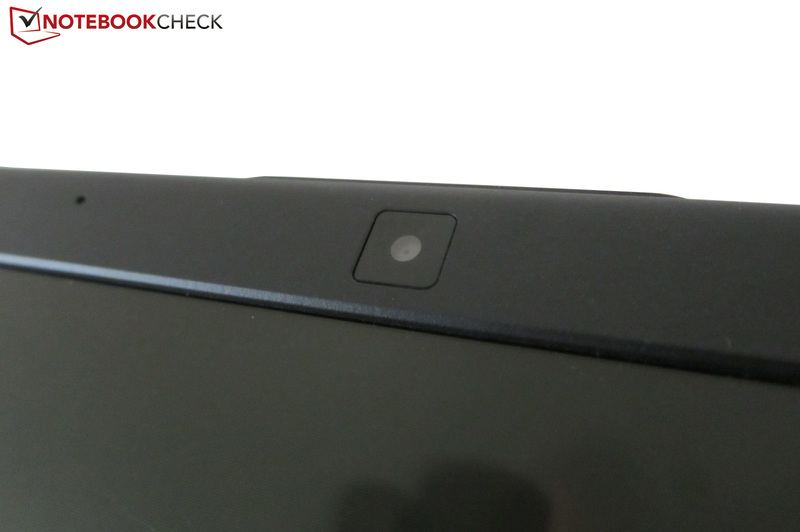 The devil is in the details: the sliding properties of the device are modest at best due to the design imprinted by Asus on the surface of the touchpad. The thin grooves of the design slow down the fingers unnecessarily. The shiny mouse keys could have been better too: clicking on one produces a loud and cheap sound. Asus has picked an ordinary HD display (resolution: 1366x768 pixels/diagonal: 35.5 cm) so as not to overexert the middle-class graphic card. The low resolution of the U46SV means that the user has less display area to work in. The screen does not have enough space for more than one window or text document. Even with this single window, the user will be busy scrolling most of the time. Users, who do not multi-task, will be able to live with this display. The InfoVision-Panel (P140NWR1) scores well in our test thanks to its good brightness: around 240 cd/m². That is where the praise ends. The illumination lies low at 79% and the contrast is below average at 155:1. The laptop also has a high black value of 1.65 cd/m². This means that dark game or film passages will have a grey tinge. Despite the glare display, the colors are very weak. As is visible from the following pictures, the display is not suited for (semi-)professional picture editing. The colors space is far too restricted for that. The biggest flaw of the display is the reflective surface. Outdoors, even the relatively high brightness fails to keep the display content legible, preventing the user from easy mobile use. In other words: we do not understand why Asus would install a glare display in an otherwise well-equipped mobile notebook. Another problem is the modest viewing angle stability. The brightness quickly changes vertically even with minor deviations of the viewing angle. 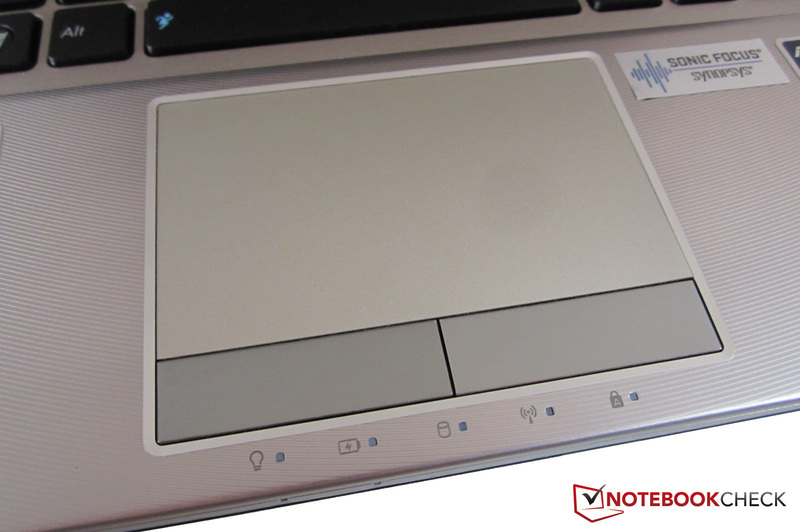 The notebook is clearly designed for a single user and even s/he will have to often adjust the screen. We should mention the fact that most devices of this class have this problem. The Intel Core i5-2410M is a dual-core CPU based on the Sandy Bridge architecture. The processor is manufactured in the 32 nm format, has 624 million transistors and a 3 MB L3 cache (Core i7 series: max. 8 MB L3 cache). 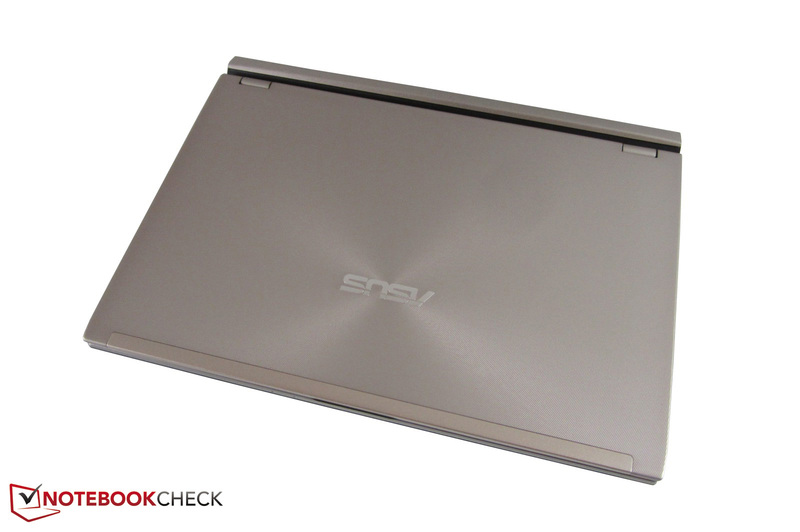 Due to the great price-to-performance ratio of this CPU, the Core i5-2410M can be found in various notebooks. A highlight of the latest Intel CPU generation is the Turbo Boost function which allows the user to easily overclock their processor. Depending on the usage, the CPU clock speed can rise from the standard 2.3 GHz to a maximum of 2.9 GHz. In our test with Cinebench R10, the CPU reached a maximum of 2.7 GHz. Another great feature is the "Hyper-threading" technology. Simply put "Hyper-threading" allows the CPU to simulate 2 virtual cores (one for each real CPU core). This allows the processor to work on 4 threads simultaneously (Quad-core CPUs - 8 threads). 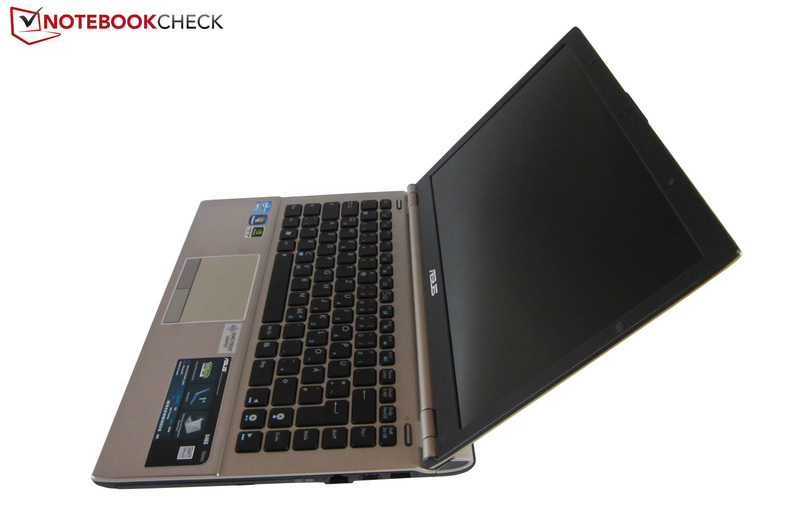 The laptop also uses the integrated graphics chip of the i5 CPU: the HD Graphics 3000. This IGP (Integrated Graphics Processor) may not be able to run the latest games but it can save a lot of power. Intel has released a faster successor to this CPU: the Core i5-2430M (2.4-3.0 GHz). The Core i5-2410M can perform at the same level as its better-equipped peers as long as only a single core is being used. In the single-core rendering test of Cinebench R10, the processor scored 4558 points, which places it squarely at the level of the quad-core Core i7-2630QM (4500 points @ Samsung 700G7A). As expected, the CPU falls behind the quad-core processor in the multi-core rendering test: 16816 vs 9768 points (+72%). In the latest Cinebench R11.5 benchmark, this gap in performance grows further to 92 % (5.0 vs 2.6 points). While using standard applications, the user will not notice any difference in performance. Even while playing games, the performance will mainly be limited by the power of the graphic card. 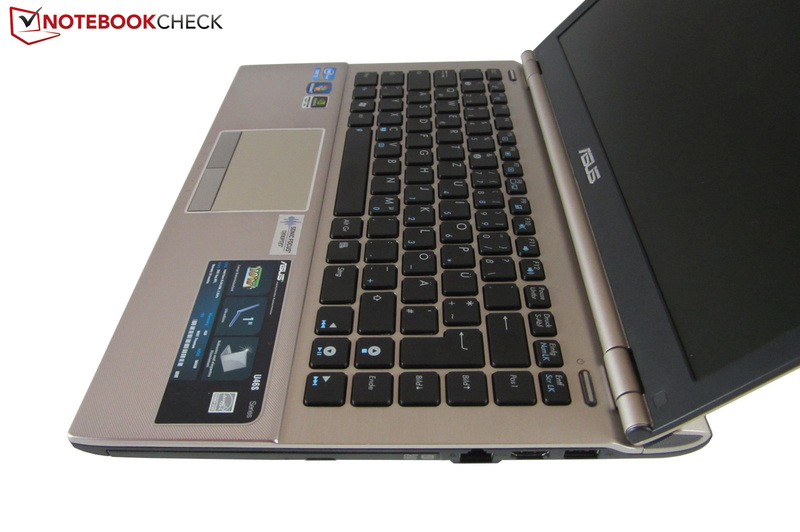 In our opinion, Asus made a good choice picking the Core i5-2410M. For most users, this dual-core CPU will deliver more than enough performance. Like the processor, this graphic card is a favorite of notebook manufacturers. Nvidia's GeForce GT 540M can be found in a lot of notebooks and has proved its worth time and again. The graphics card supports DirectX 11 and is based on the Fermi generation. The GT 540M has 96 Unified Shaders (1344 MHz) and 1024 MB DDR3 VRAM (900 MHz). The core clock speed lies at a good 672 MHz. Sadly the memory interface is limited to a mere 128 bit. This card offers a variety of features. The graphic card can decode audio and video material and supports PhysX, which, like its name suggests, allows the graphic card to execute physical calculations on the graphic card. Unfortunately the GeForce GT 540M is too slow for most advanced physical calculations. We manually upgraded the driver (ForceWare 285.62) so as to allow the graphic card to perform at its full potential during our test. Tip: the Radeon HD 6650M from AMD is a good alternative. 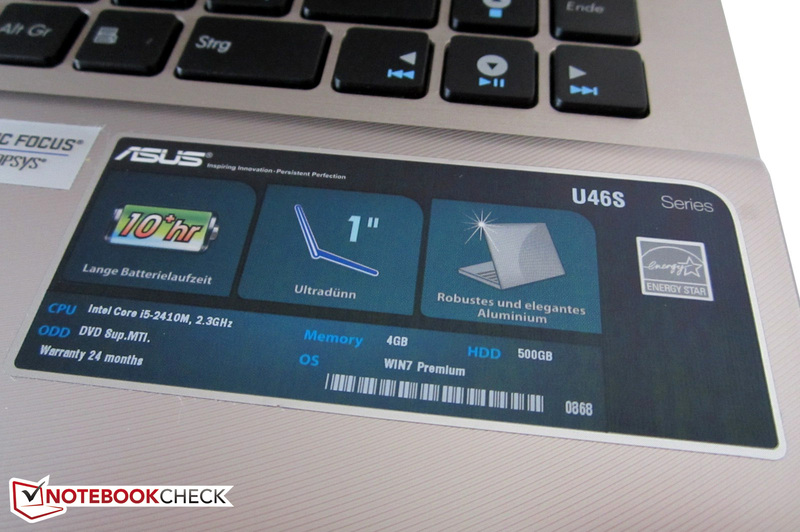 The Asus U46SV has a long battery life thanks to integrated graphics switching technology. Nvidia's Optimus technology is currently the best technology for automatic graphics switching. Short explanation: Optimus activates the dedicated GeForce graphic card only when a program requires more graphics performance. Simple tasks, such as office work or surfing the internet, are handled by the HD Graphics 3000 and the GeForce GT 540M takes over while gaming. As long as the driver is properly configured, Optimus performs perfectly: the system picks the right graphic card for the task at hand. In the Nvidia control panel, the user can configure various settings to suit his/her needs. AMD's automatic graphics switching technology (codenamed "BACON") performed poorly in our comparison test. The GeForce GT 540M performs at a middle-class level. In the Unigine Heaven 2.1 benchmark (1280x1024, High, Tessellation normal) the graphic card delivered an average of 14.4 fps. The lower-end GT 520M fell behind (7.7 fps @ Asus U36SD) and the high end GTX 560M took the lead (27.7 fps @ Medion Erazer X6817). In 3DMark 11 the graphic card scored 971 points (1280x720, "Performance" settings, GPU score) which is a decent result. There are other laptops available for less than 1000 Euros with a far stronger graphic card, such as the GeForce GT 555M (1099 points @ Schenker XMG A501), or the Radeon HD 6770M (1379 points @ HP Pavilion dv6). The single hard disk slot is occupied by a 500 GB hard disk from Seagate. 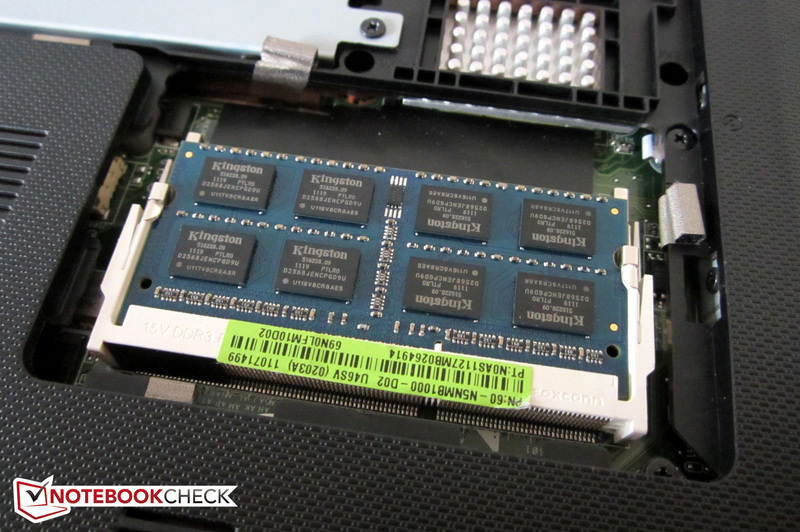 Unlike the other hardware components, we were not impressed by the hard disk (ST9500325AS - 5400 rpm). The reason is clear: the performance is quite low. 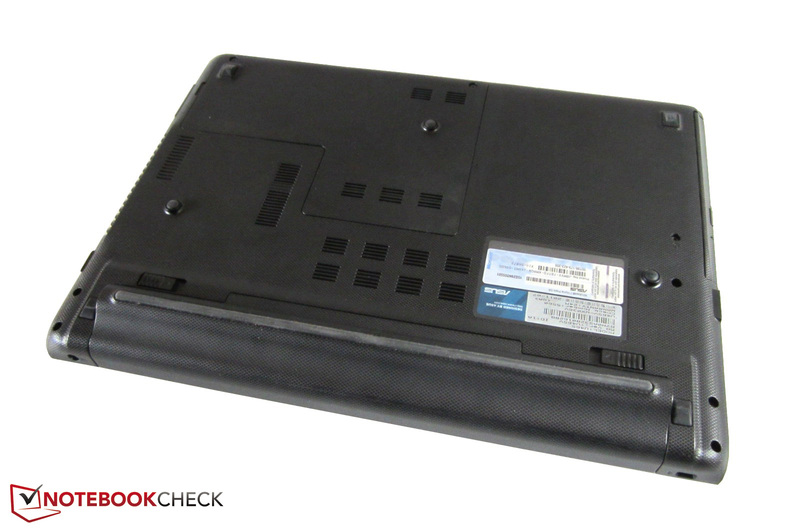 Good 5400 rpm hard disks such as the Samsung Spinpoint M8 can reach sequential read and write rates of up to 100 MB/sec (see the Schenker XMG P511). Our Seagate hard disk could barely reach 70 MB/sec (CrystalDiskMark). In HDTune, the average transfer rate lay at around 62 MB/sec. Loading programs, transferring data and installations were (subjectively) slower than with most devices. This hard disk is far slower than a 7200 rpm hard disk or a SSD. In short: Asus saved money on the wrong component. Overall, the U46SV offers good system performance. 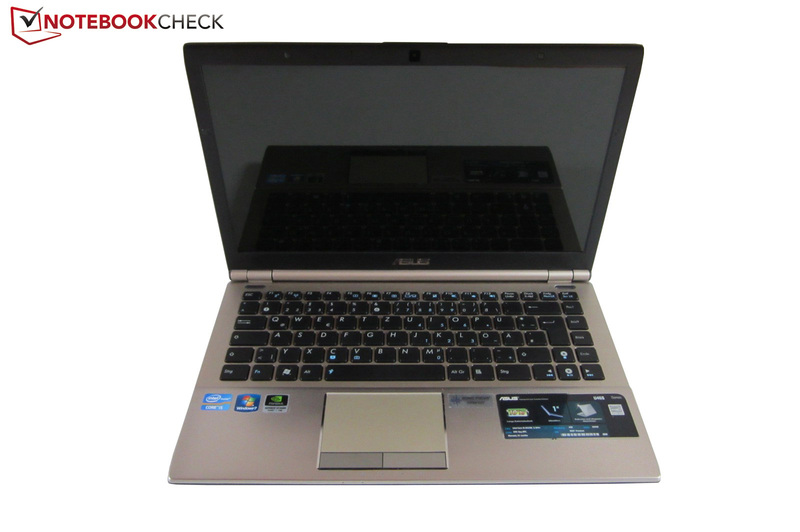 The buyer can get a well-equipped all-round notebook for around 750 Euros. The laptop can easily handle everyday tasks such as Office work, watching films, or surfing on the Internet. Thanks to the dedicated graphic card, the 14 inch laptop can even deliver good 3D performance. This statement is supported by PCMark Vantage where the U46SV scored 6000 points. 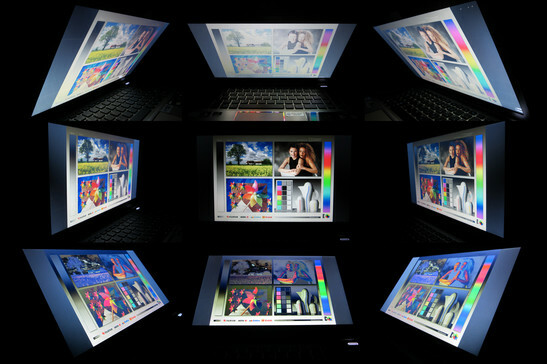 Other multimedia notebooks with dedicated graphic cards (such as the Acer Aspire 4830TG) perform at a similar level. Can the 14 inch model run the latest games? We ran four of the latest games on the test model and noted the performance. More game benchmarks on the GeForce GT 540M can be found in our extensive list. The high requirements of Battlefield 3 push the GeForce GT 540M to its limits. The game did not run fluidly at medium or high settings (Single player mission: "Operation Swordbreaker"). Once the graphics settings are set to low, the Ego shooter runs at a decent pace (36.5 fps @ 1024x768). Other middle-class graphic cards, such as the Radeon HD 6750M (see the Samsung 700Z5A) also have to fight hard to deliver a fluid experience. Gamers interested in playing Battlefield 3 with high details and anti-aliasing in Full HD will need a high end graphics card, such as the Radeon HD 6970M (see the Samsung 700G7A). The newest addition to the popular "The Elder Scrolls" series is more conservative with resources. The game does not run fluidly at high details (with 8x AA & 8x AF) in the native resolution. The experience improves when the details are set to medium and the Anti-Aliasing is set to 4x (~32 fps). In comparison: the GeForce GT 555M can run the previous configuration at 37 fps (Acer Aspire 5951G), and a Radeon HD 6770M can manage 43 fps (MacBook Pro 15). High details require a graphic card of the upper middle class. Playing at 1920x1080 pixels and Ultra settings is only enjoyable with a high-end graphics card, such as the GeForce GTX 570M. The strategy game Anno 2070 performed at a similar level. High settings (AA on & 2x AF) made the intro video of the first mission stutter noticeably: 19 fps are too little (even from the bird's eye view) for this game. Medium details ran at the native resolution without a problem (31 fps). Gamers, who desire high details, should pick a notebook with a high-end graphic card (such as the Medion Erazer X7813). Less demanding games, such as Fifa 12, can be run by the GeForce GT 540M flawlessly. The game ran at around 100 fps (good gaming experience) with high details and 2x AA. The CPU IGP (HD Graphics 3000) can run the game at medium details as well. Nowadays, the GeForce GT 540M gets pushed to its limits quite often. The latest games run poorly at high details. The graphic card can only deliver a fluid experience at medium details (for example, Anno 2070 and Skyrim). There are a few exceptions where the graphic card can only run the game at low details. As is noticeable in our Games Comparison, the GeForce GT 540M can deliver a better gaming experience with older and less demanding games. This graphic card is intended for the occasional gamer, who is not afraid of running the game at low details and deactivated AA if s/he has to. "Proper" gaming laptops sport at least a GeForce GTX 560M. The noise emissions are acceptable. While idle, the cooler fan often stays off, whereas the hard disk emits a constant (but not distracting) swoosh or clatter. 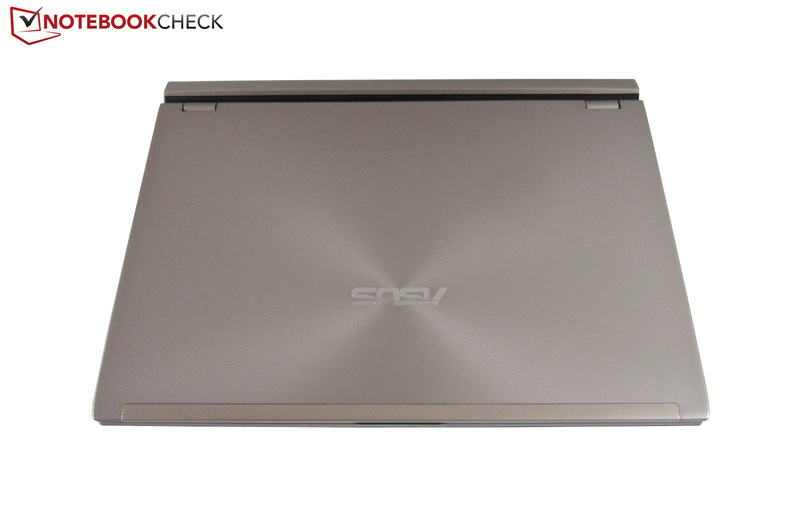 If a SSD were installed in the U46SV, the laptop would not make any noise while idle. Higher load causes the fan to kick in, which can be heard clearly. In comparison to other devices, the cooler fan of the test model emits noise at a higher frequency while running demanding 3D programs. Some users might be disturbed by this level of emission. However, game sounds are only drowned out during the quieter scenes. The optical drive is also not the quietest available. The multimedia laptop is never really cool. Even while idle, the notebook is slightly warm, and the metal hand-rest regions reached around 30 °C after two hours. 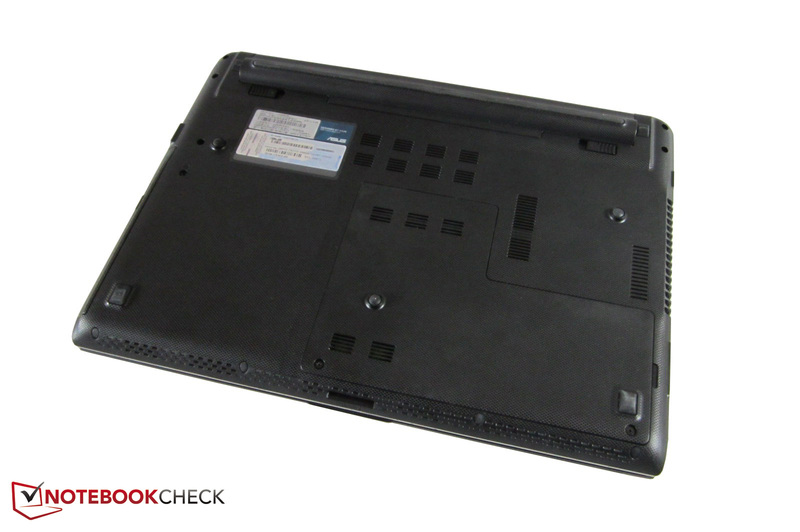 High load causes the surface of the laptop to reach a maximum of 39 °C, whereas the bottom reaches up to 49 °C. The temperature emissions should not discourage buyers from purchasing this notebook as very few users will find the temperature emissions to be a problem. The components have to bear a much higher temperature. According to the HWMonitor tool, the graphics card and CPU had temperatures around 80 °C in our stress test (FurMark and Prime95). Unfortunately these standard temperature values come at the price of throttling with the CPU. As soon as the stress test started, Intel's Core i5-2410M reduced its clock speed to 800 MHz. Still, the notebook runs free of throttling normally. The right speaker of our test model did not work. As such we can not provide accurate information about the audio quality of the (hopefully) fully-functioning models. The U46SV barely consumes 10 W while the Intel IGP is active. As soon as the GeForce GT 540M starts up, the power consumption shoots upward to around 80 watts, which is an acceptable value for the offered performance. The Samsung 700Z5A is a 15 inch model with a Core i5-2430M and a Radeon HD 6750M. Its power consumption while idle is slightly more than that of our Asus test model. However, under high load, the Samsung competitor consumes less power than our test model. As mentioned at the beginning of this review, Asus promises 10 hours battery life for the U46SV. In the Reader's Test from Battery Eater, the laptop did not last as long: with minimum brightness and all energy-saving options turned on, the laptop ran for nine hours. Still, most laptops have a shorter battery life. So around 5.5 hours of wireless surfing with medium brightness is very good. DVD playback is possible for 4.5 hours and is also a respectable performance (maximum brightness and modest energy-saving). 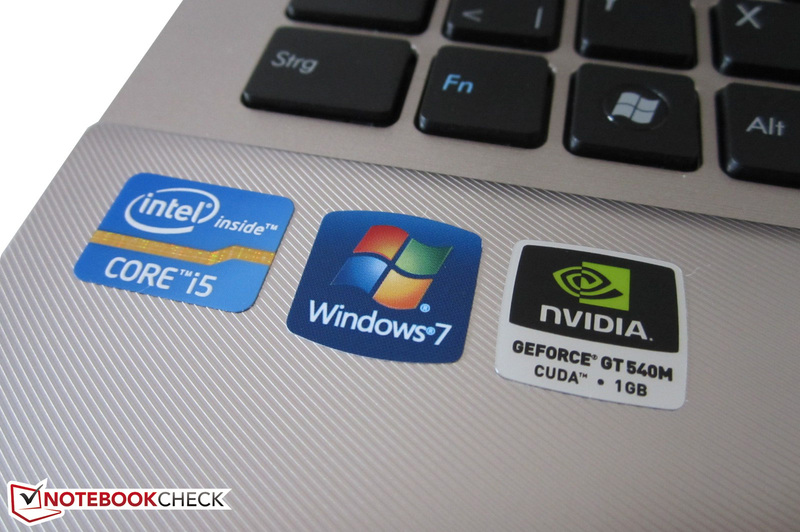 At high load and with the Nvidia graphics card, the run time drops significantly: in the Battery Eater Classic Test, the laptop was drained after two hours. The previously mentioned Samsung 700Z5A lasts slightly longer. 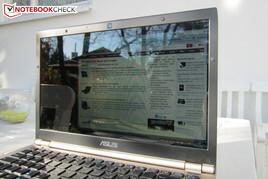 The U46SV-WX036V has a few flaws but overall Asus has done a good job. This 14 inch laptop weighs 2.3 kg and will excite users with its stylish design, resistant surfaces and great input devices. 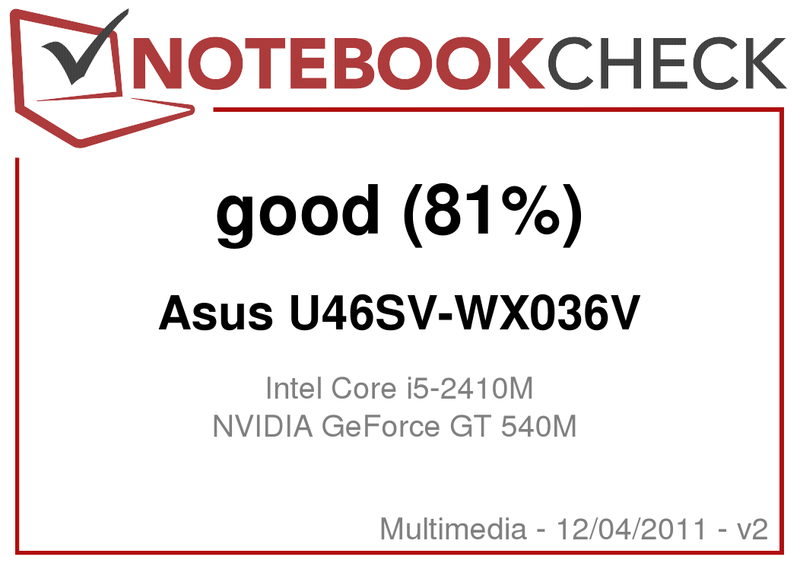 Even the performance is appropriate: Asus could not have installed a better graphics card than the Nvidia GeForce GT 540M (insufficient cooling). 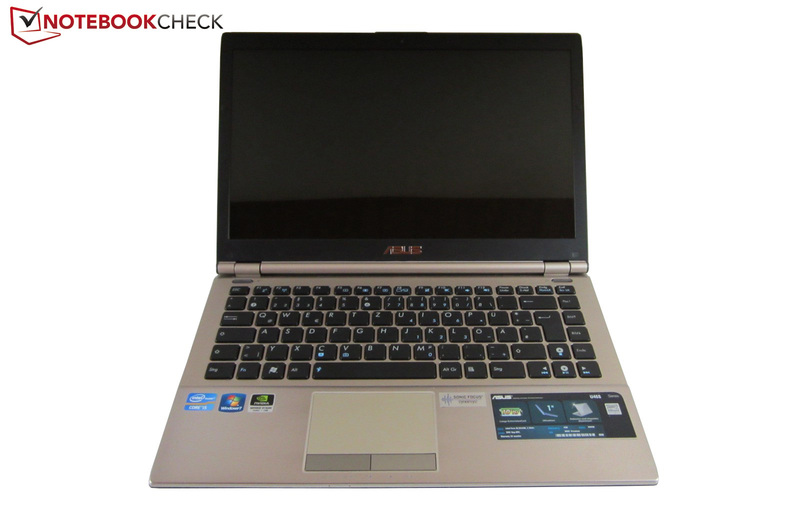 Paired with the Core i5-2410M dual-core CPU and 4 GB DDR3 RAM, everyday tasks run flawlessly. Demanding 3D applications, such as high-end games, push the hardware components to their limits. One of the biggest strengths of this notebook is its long battery life: over 5 hours are possible with maximum brightness. Various flaws prevent us from giving the notebook a better rating. The pre-installed "Bloatware", slow hard disk and cheap reflective display (poor viewing angle, contrast and too high black value) are not the flaws a multimedia notebook should have. Users who need a laptop for work on-the-go, should pick a laptop with a matt display (such as, the Acer TravelMate 8473TG). The assortment of ports (no ExpressCard, eSATA or FireWire) leave much to be desired. 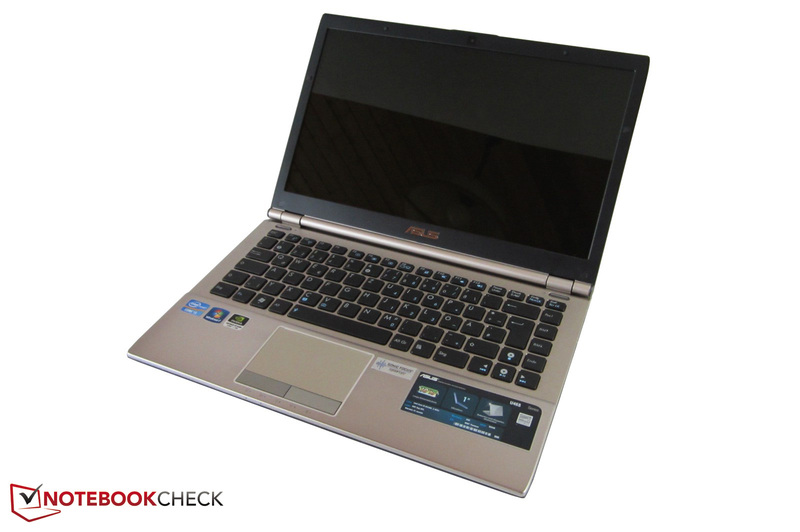 All-in-all, the U46SV is a fairly priced all-round notebook from Asus. 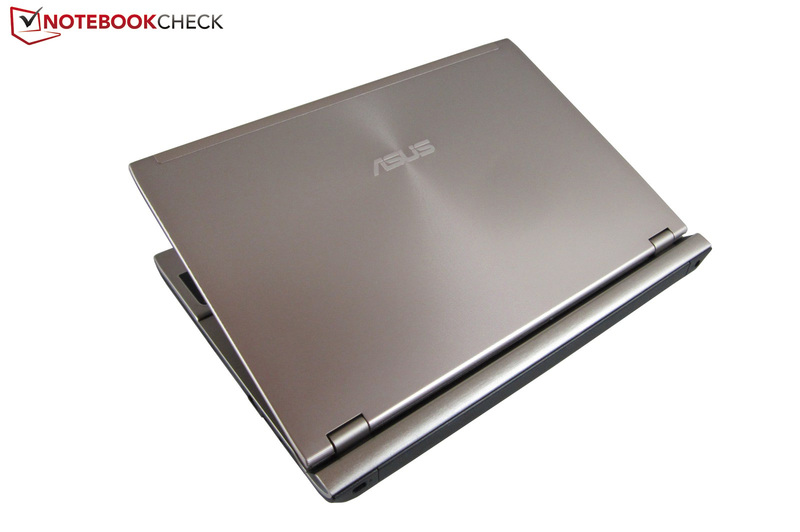 The silver surfaces give the laptop a refreshing look. Thanks to the free RAM slot, the RAM memory can be increased. The battery takes up the entire rear of the notebook. The upper display border houses a webcam and a microphone. The keyboard reminds us of the Clevo barebones. A special key can be used to switch the power plan. 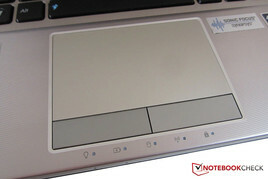 As is indicated by the price, the notebook uses middle-class hardware. The 14 inch model has various unique features. Even the touchpad is big. The back of the laptop holds a Kensington Lock. The power outlet is placed at the back. The left side has a VGA interface. 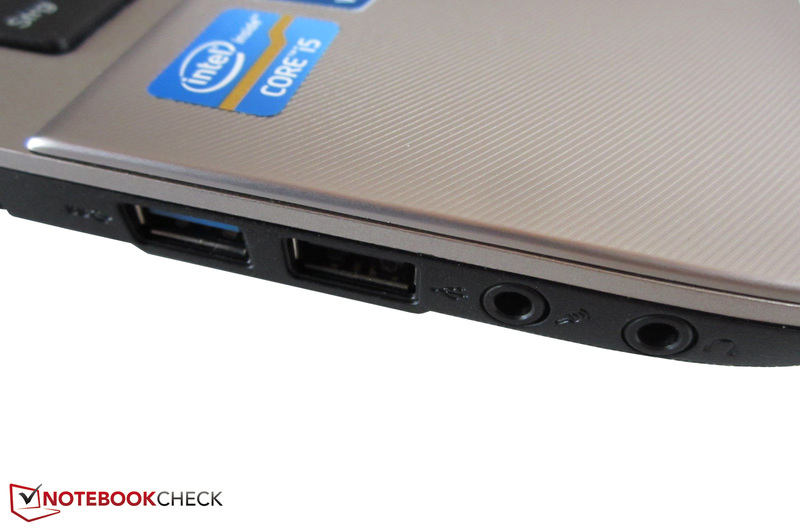 The placing of the USB and sound ports are a matter of preference. The right side holds a Gigabit LAN port and a HDMI interface. 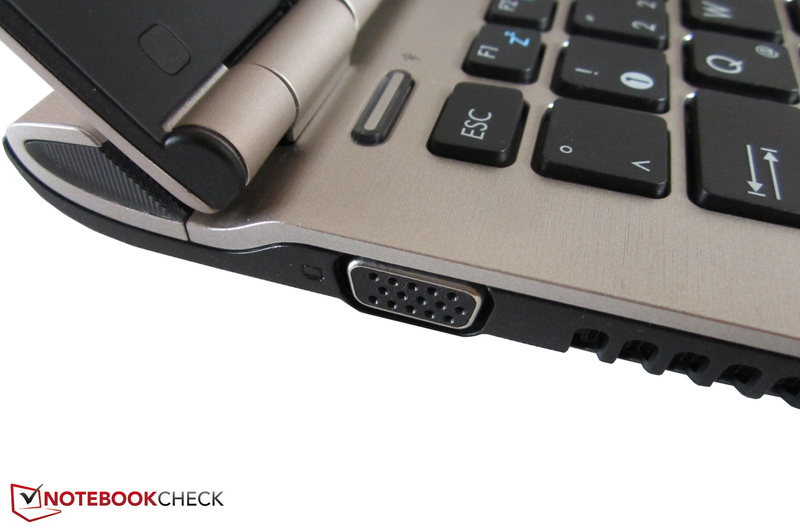 The front of the laptop has a 4-in-1 cardreader. The installed hard disk is not the fasted available. The battery has a great capacity of 74 Wh. Only the RAM and the hard disk can be easily reached. 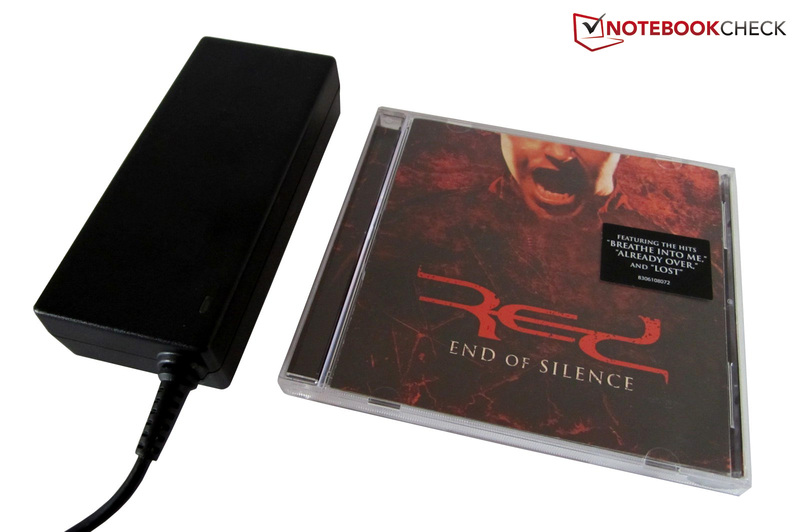 The great input devices are one of the biggest strengths of the U46SV. Dirt and fingerprints are hard to find on the case. 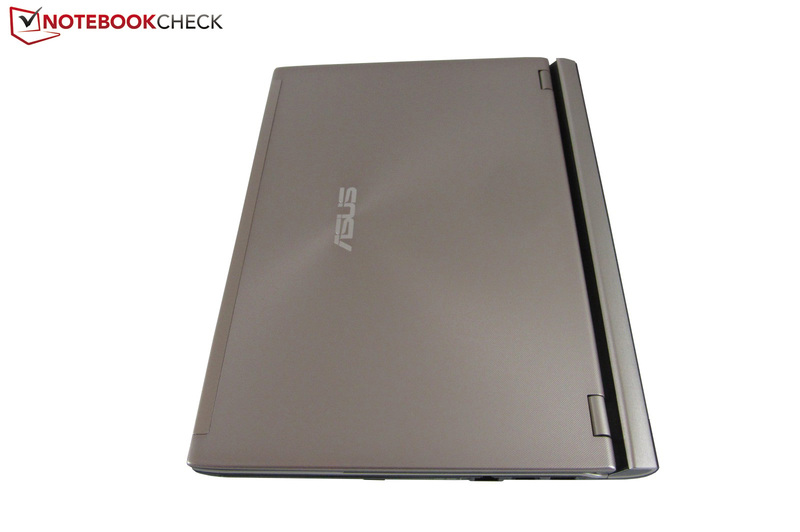 The display cover, hand-rest regions and the bottom of the laptop have a nice design. The case is partially made of Aluminium. 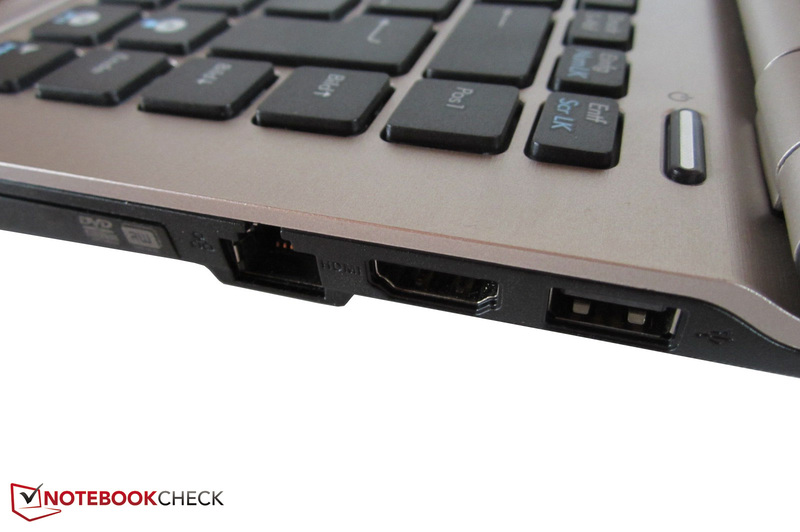 Without the battery, the laptop is 2.8 cm thick. The opening angle of the display should suffice most users. There are a few flaws in the workmanship. A matt display would have been a better fit for the U46SV. The hinges are placed a bit forward. 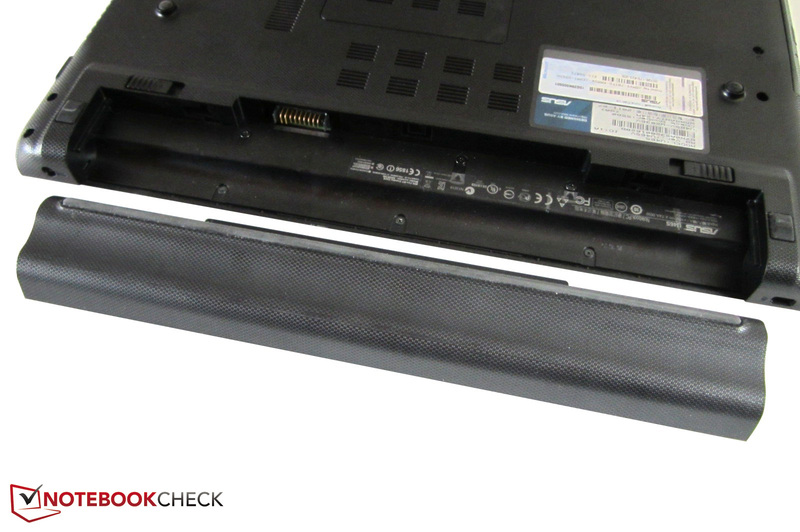 The battery pushes the back of the laptop one centimeter higher. Sadly, the keyboard lighting does not work. 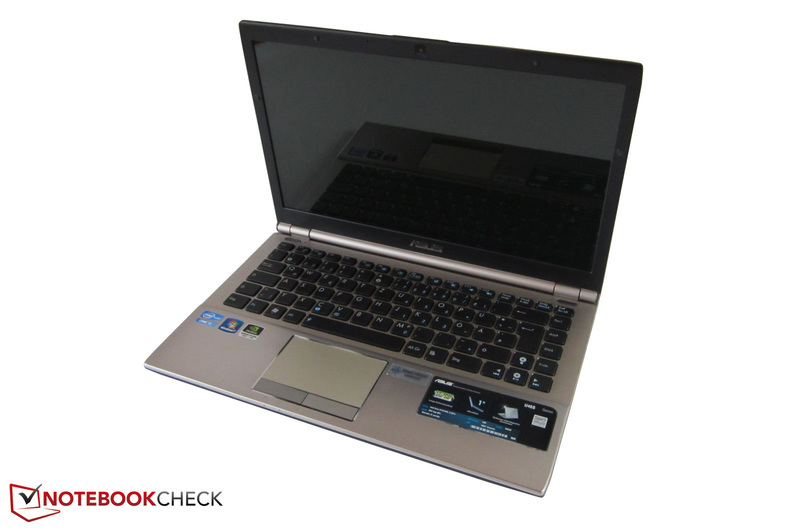 The overall concept of the laptop is similar to the Series 7 Chronos models from Samsung. Warm air is pushed out from the left side of the laptop. A standard DVD burner is installed as the optical drive. The service flap is secured with two screws. The 90 W power adapter is quite handy. - A lot of "Bloatware"
The good mix of performance and mobility. A better picture and sound quality. Why did Asus not use an anti-glare display? 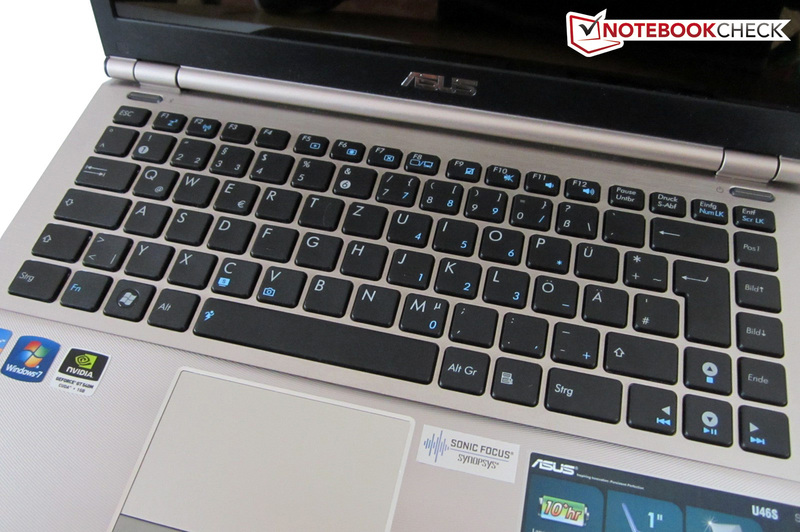 14-inch all-round notebooks with a dedicated graphic card: the Asus X43SV, the Acer Aspire 4830TG, the Acer TravelMate 8473TG or the Packard Bell EasyNote NX69.